The men of the 100th Infantry Battalion have never forgotten their comrades who were killed in combat. 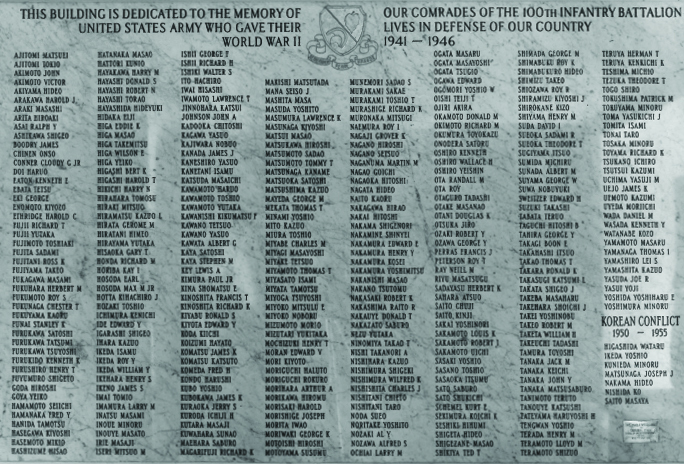 After the Honolulu clubhouse was completed in 1952, a single marble slab was imported from Carrara, Italy and inscribed with the names of the 338 soldiers* of the battalion who had been killed in action during World War II and seven more who later died in the Korean War. 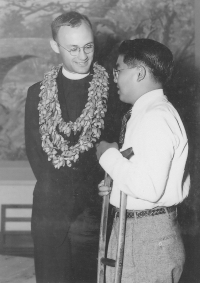 The battalion’s chaplain, Israel Yost, visited Hawaii in 1947 and conducted memorial services on the different islands. On September 1, 1948, the “Dalton Victory” arrived in Honolulu Harbor, carrying the remains from overseas cemeteries of 79 island soldiers. Representatives of the 100th, 442nd Regimental Combat Team and Military Intelligence Service boarded a Coast Guard cutter to greet the ship and tossed floral wreaths into the ocean as the ship passed Diamond Head. Many uniformed veterans waited on the piers. Internment ceremonies were held in the newly opened National Memorial Cemetery of the Pacific (Punchbowl Cemetery) and in county cemeteries on the other islands. Other soldiers who were killed in action are buried in cemeteries on the mainland United States and in American military cemeteries in Europe. The bodies of six soldiers were sent to their parents who had returned to Japan. Over the years, veterans and their families have visited Italy and France, stopping at the Epinal Cemetery outside of Bruyeres, France to honor Tomosu Hirahara and Yoshio Tengwan and the Sicily-Rome Cemetery near Nettuno, Italy where Jack Johnson, Lewis A. Key, Edward V. Moran and Kurt E. Schemel are buried. Every year a memorial service is held at Punchbowl on the Sunday near September 29th when Sergeant Shigeo Joe Takata became the first 100th soldier to be killed soon after the battalion’s September 1943 arrival in Italy. Services are held on Memorial Day in various locations during which those who were killed in action are remembered. *Years later, it was discovered that one name had incorrectly been included on the plaque when Kozo Watanabe traveled from the mainland to attend a battalion reunion and visited the clubhouse. Another veteran, Stanley Akita of Honolulu, had been captured at the same time as Watanabe. Since he did not see Watanabe again after they were prisoners of war, Akita assumed that he had been killed. Besides the three stories located in this section about Matsuei and Tokio Ajitomi, Kiyoshi Jimmie Shiramizu and Hideyuki Hayashida, the special Hawaii Herald issue commemorating the 50th anniversary of the 100th included three stories about men from Oahu, Maui and Kauai who were killed in action.